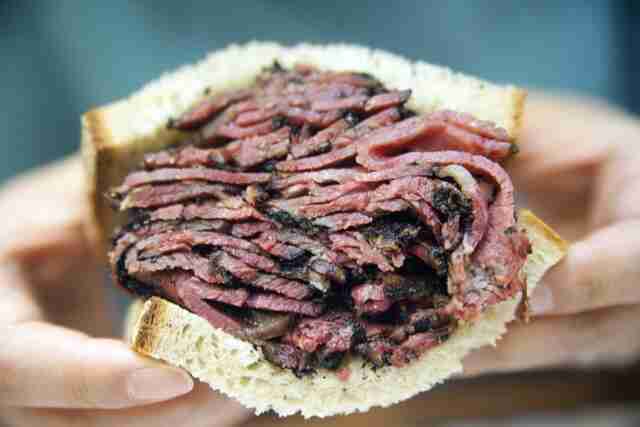 An inherent part of New York City’s culture is its devotion to pastrami, which was originally created as a way to preserve meat -- typically beef -- before refrigeration. 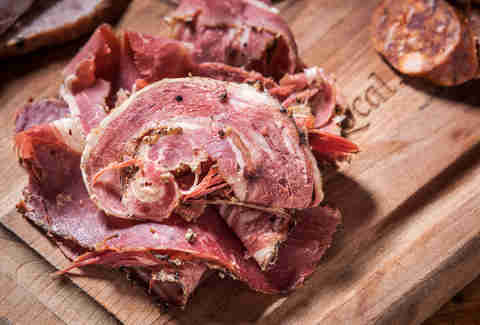 Curing raw meat, then seasoning it with a special spice blend before smoking and steaming it became a ubiquitous practice by Jewish immigrants in 19th-century America -- and so beef pastrami (accompanied by a hearty smear of yellow mustard and slices of rye bread) ended up finding a home in New York’s Jewish delis. Today, it’s as popular as ever -- from modern takes (like the thick-cut pastrami, egg & cheese breakfast sandwiches at Frankel’s Deli) to the classic, unaffected pastrami on rye (like Katz’s and Sarge’s). 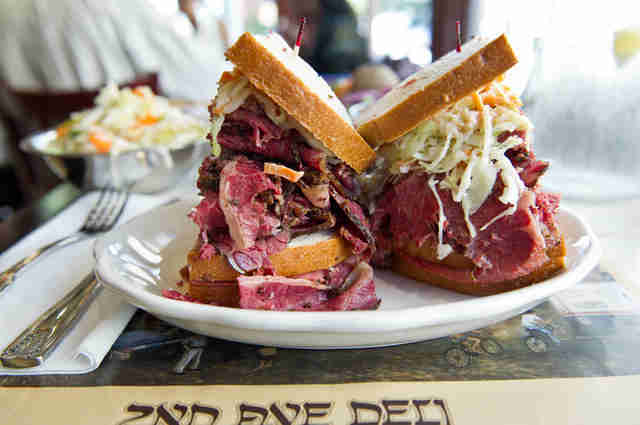 These are the best places for pastrami in NYC. Frankel’s has effectively transported the Lower East Side to Greenpoint, gearing the Jewish deli toward hungover Brooklyn 20-somethings. The pastrami here is thick cut -- similar to Katz’s -- but in small enough pieces that you can easily pop a chunk into your mouth. 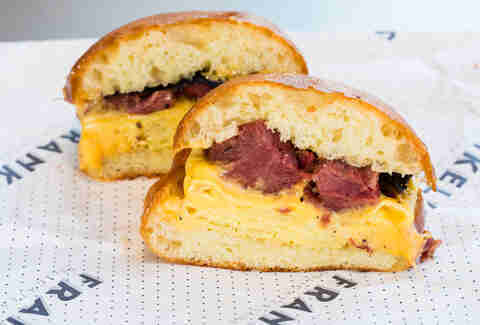 Get it hot on rye bread with mustard, or opt for the non-traditional egg-and-cheese breakfast sandwich made with pastrami instead of bacon. 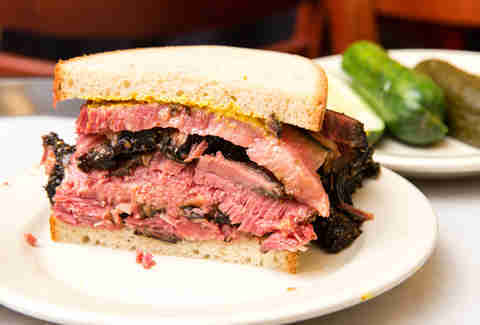 Pastrami is second nature at Second Avenue Deli, which was founded in the East Village in 1954 and quickly evolved into a local stand-by known for stacking rye bread with thinly sliced, marbled pastrami. Although the original location shuttered in 2006, two new ones popped up across the city a couple years later, offering the same warm, lovingly chaotic ambiance and comforting deli fare. And at just $10 for a hot pastrami sandwich, you can easily toss in a side of coleslaw and a sour pickle to round out your meal. 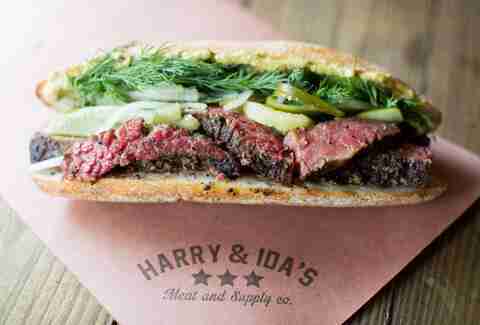 Harry and Ida’s Meat and Supply Co.
Tucked into Avenue A is an unassuming, tiny storefront that will transport you to an old-world general store far away from Manhattan, with a tin-stamped ceiling and wooden shelves stacked with oils, jams, and spreads. Provisions aside, it’s Pop’s Pastrami sandwich that defies expectations and traditional pastrami norms here. Thick slabs of burnt-end brisket, displaying the customary black spice rub, are piled onto a lightly toasted hero, then intensified with dill, fermented cucumbers, a sprinkling of rye berries, and a smear of crackling mustard. A Lower East Side fixture since 1888, Katz’s is the quintessential New York pastrami purveyor, and one of the few places in Manhattan -- and now Brooklyn, too -- where locals and tourists mix and mingle. The sandwich here is sweet, juicy, famously massive, and one of the only ones still made with hand-carved meat. You’d be hard pressed to find a more classic New York meal than Katz’s pastrami on rye with Dr. Brown’s Cel-Ray soda. What Eisenberg’s lacks in decor it more than makes up for in a simple pastrami Reuben sandwich. Plop down at one of the 25 seats at the counter, preferably next to a guy who’s been downing egg creams and tuna melts in the same seat for over 20 years, and watch as the chefs behind the counter systematically construct the sandwich from toasted and browned rye bread, layers of pastrami, melted Swiss cheese, sauerkraut, and a dash of Russian dressing. Is it Katz’s? No, but between the ambiance, shabby digs, and food offerings, it’s undeniably comforting. David’s in Bed-Stuy was founded by Jews, serves all the essential Jewish deli meats, and is now run by observant Muslims, who serve up a unique and delicious halal pastrami. The restaurant is open every day (with a two-hour break for Friday prayers), and the pastrami has that signature mix of sweet and spice. Plus, with a sizable “small” selling for only $8, it’s a crazy-good deal. After being destroyed in a grease fire in 2012, family-owned Sarge’s in Murray Hill heroically reopened two years later better than ever. 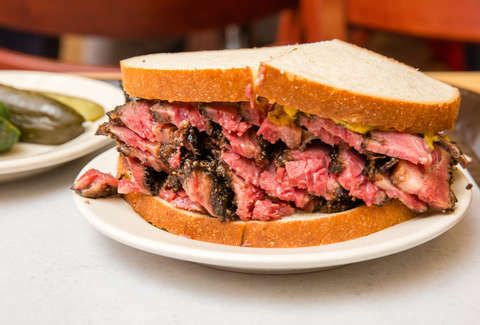 It prepares all of its piled-high pastrami on-site, and is also the only deli in the city open 24/7 every day (Katz's is only open late on weekends), making it a very worthy end-of-the-night destination. At first glance, Dickson’s appears to be just a butcher shop, albeit one that publicly machetes hunks of meat in the open space at the back of the store. The head-to-tail butchery only supplies humanely raised meat from nearby farms. The beef is soft and delicate, thanks to the smoking and steaming processes, and tucked between slices of multigrain bread with Cheddar and a hearty portion of apricot chutney, before being flattened in a panini press like its Italian sandwich predecessors. One of the few quality Uptown pastrami joints, Pastrami Queen has been serving thick sandwiches since the late ‘90s, after moving from its original home in Queens. Try the classic pastrami with Russian dressing, or if you’re feeling extra adventurous, try it as part of a massive triple-decker, along with some combination of corned beef, salami, tongue, turkey, or chopped liver. Not to be confused with the Ben’s chain of delis, no-frills BB’s on Queens Boulevard serves a uniquely old-style, spicier, darker pastrami, that’s been an unsung local favorite since 1945. Be sure to also try the tongue and the rolled beef. A Bronx mainstay since 1953, Liebman’s is one of the few remaining Kosher, family-owned Jewish delis in New York. 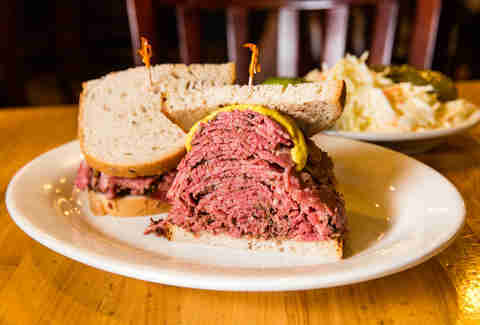 Those willing to make the schlep up there will be rewarded with pastrami as good as what you’ll find at Katz’s, only cheaper and with basically no tourists. This old-school Brooklyn deli is not only popular with Sheepshead Bay locals, it also made an appearance on the final episode of Anthony Bourdain’s No Reservations. Despite the vintage decor and experienced staff, the place has only been around since 1993. 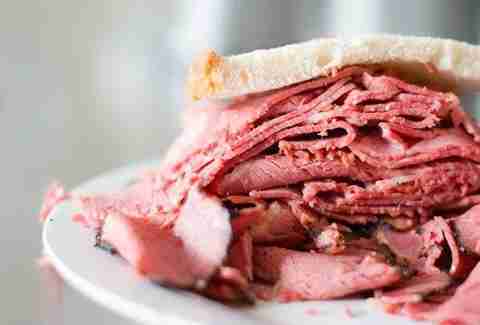 Either way, this is top-notch, no-nonsense hot pastrami -- smoky and perfectly fatty, served traditionally on rye. Amy Schulman is an Editorial Production Assistant at Thrillist who spent a great deal of her childhood eating pastrami at Second Avenue Deli. Follow her on Instagram. Ben Jay is a photographer, journalist, carnivore, beer, and whiskey drinker, and music nerd, and his hobbies include brisket and Liverpool FC. You can find his work at Gothamist, Serious Eats, Edible Brooklyn, Edible Manhattan, the Village Voice, or follow him on Twitter and Instagram.